Inbetween (Kissed by Death #1) by Tara A. Fuller. Publication : August 28th 2012 by Entangled Teen. Honestly, I don't even know how to begin. Lately, every paranormal novel I've read seems to be a cliche but Tara Fuller completely surprised me. Scratch that, she blew me away. Inbetween is a love story; epic, timeless love story which has been pulled off perfectly only a handful of times in YA novels. With all the fluff that I've come across in the paranormal genre lately, while I expected Inbetween to be an engrossing novel, I didn't expect to be sucked in as much as I did. The story begins with Finn, a reaper of the Inbetween - a place between Heaven and Hell where some souls wander until they get sorted into one of the two places or be born again - going to collect a soul at a car crash. What he didn't see coming was the girl in the accident to be the love of his life afterlife, Allison, re-incarnated. First off, I've read a few reaper stories and I loved Tara's take on them. Although the story focused more on the characters, the world-building's unique and so different from the other reaper stories that I've read. The concept of an 'Inbetween' area between Heaven and Hell made this book stand out from all the rest. Throw in the forbidden and intense love story, I'm hooked. The characters, God, where do I begin? I'm attached to all of them. Easton is like Jughead from the Archie comics - he watches from the sidelines, he's friends with all the main characters and he has his significant role to play but it's subtle and he adds to the entertainment. I'm not sure if I'm making any sense right now. As for Cash, I spent the first 150 pages not knowing who to root for, Cash or Finn, because I'm completely crushing on Cash right now. Finn might be the Romeo of this book but Cash is like..Adrian from VA - the guy you're going to swoon over even though you know that she's not going to end up with him. I noticed that this is a series and I'm crossing my fingers, hoping that the next one is about Cash and Anaya because while I loved Finn, I have a soft spot for a bad boy who's messed up and trying to figure himself out. Besides, he's adorable. You'd love him too. Cash rolled his eyes "I always knew there was something wrong with you. Now turn around so I don't ruin you for other men." Tara's added humour made this book complete. The Justin Beiber and Judy Blume references, along with the witty dialogues had me snorting quite a few times. "Screw you. You're the one haunting a high school student." "I'm not haunting her. I'm protecting her." Inbetween has found itself a place on my favourites shelf and like I said, I can't wait to read the next book. It's an intense, emotional love story with an engaging plot, interesting world-building, wonderful writing and excellent supporting characters. This is one of those extremely rare books where the author has done everything right. 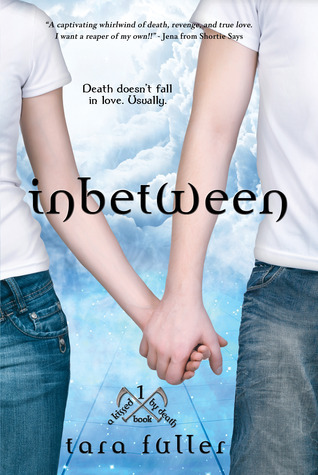 Frankly, Tara Fuller just restored my faith in the genre; Inbetween gives me hope that there're still some good young adult paranormal romance stories out there (emphasis on the romance. Really, it's that good). Fans of paranormal romance novels like Twilight (but with much better writing and smarter characters) and Fallen will enjoy this (I think)! I passed up on this because he cover looked clinical. You're like the third person who raved about this, I must get it then. I felt exactly the same way about Cash and Finn! They are two amazing guys. Comparing Cash to Adrian is PERFECT. This book sounds great! it has everything I look for in a YA novel and I can't believe it has been sitting on my Kindle from Netgalley for ages now! Must get to it super soon..
Thank-you for sharing your wonderful review! Cash & Finn sound amazing.